Little Red House for Mosaic Monday to share all your beautiful images. Beautiful tiles. And so interesting; I think the middle is my favorite. The tiles are beautiful. Happy Mosaic Monday and Happy Spring! What pretty tiles! They make a great mosaic. Hi, Love your Mosaic! I hope that you have a wonderful rest of your day. Happy Spring! This tile is so great! Love all the detail and some of my favorite color combos! Beautiful blue tiles. Love all of them. I love these tiles! Beautiful mosaic as always :) Happy Blue Monday! My Blue Monday's here! Such lovely tiles..thanks for sharing. I love hand painted tiles! I taught a class on tile painting some years back and it's not as hard as you might think - there's a line of glazes out, made in France, that can be fired right in your kitchen oven. You've inspired me to do a post on my own blog about it in the near future! Thanks! What a lovley mosiac! The colors are beautiful!! I would have a hard time picking a favorite from all those pretty tiles. They each are unique in their own way. Tiles are a classic for mosaic, after all! Those are an exceptional collection. Candy, what pattern are the green depression glass tumblers that are often in your table settings? They look somewhat like Hazel-Atlas 'New Century', but I didn't think there were footed tumblers in that pattern. I'm very new to depression glass, though, and don't have any books here to look them up, so if you know I'd love to learn about these. Thanks. I so appreciate you all stopping by to see my mosaic for today! It is a bright sunny day here in California and it smells like Spring! I'm on my way out to Home Depot to find some paint for a project I'm working on. Before I forget let me address Nell's question about the green depression glasses that you'll see on many of my tablescapes. I'm not really a collector of depression glass, so my knowledge base is very limited. A reader of TLRT actually did ID these for me several months ago as Anchor Hocking's "Pillar Optic" design, sometimes called "Logs" or "Log Cabin"
I like the symmetry of the third tile on the top row. 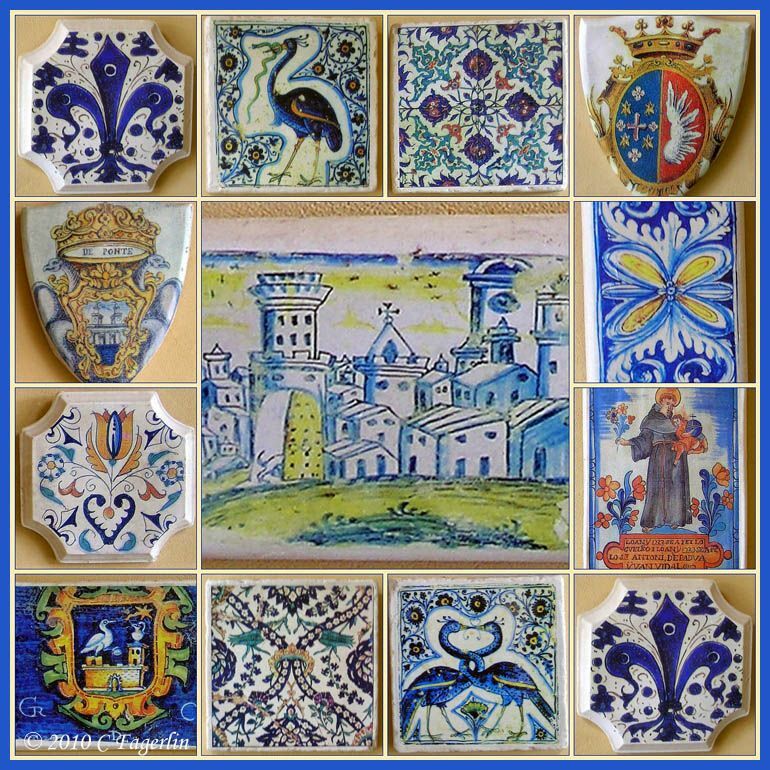 Beautiful tiles! Were they made by you or someone else? Thank you all for coming by and checking out my tiles! Charlotte, I purchased these about 5 years ago from a catalog.